"And said unto them, Sirs, I perceive that this voyage will be with hurt and much damage, not only of the lading and ship, but also of our lives." Paul, as a prisoner, was on his way to Rome when the storm struck out at sea. Though tossed about by the great waves and strong gusts, Paul held a confidence in God. He even shared his faith with the ship's crew who were his jailors & fellow prisoners. An abiding faith in the true & living God will always give us the faith to share with others as Paul did on that tempestuous day. Point #1: God was the Source of his faith. After all, Paul knew that God was the Creator of the universe. So, what were waves to Him that set the tide in motion? He was keenly aware that God parted the Red Sea and the Jordan River. 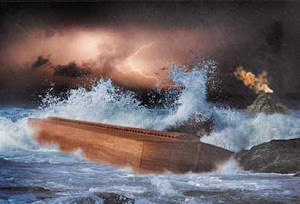 To be sure, he also knew that Christ stilled the tempest out on the Galilean Sea (Mark 4:35-39). Indeed, Paul penned these very words in I Corinthians 2:9-10, "But we had the sentence of death in ourselves, that we should not trust in ourselves, but in God which raiseth the dead: Who delivered us from so great a death, and doth deliver: in whom we trust that he will yet deliver us;" Thus, Paul believed God and trusted in Him. Do you trust Him, Reader? Point #2: God was the Source of revelation. Paul had a basis for his faith which was determined not by a whimsical fantasy of hope, but by the hard facts and accounts which were found in God's Holy Word. He confessed it before the pagans: "...[F]or I believe God, that it shall be even as it was told me." (v. 25) God's word is a more sure word of testimony than anything else, and a more sure word of prophecy (II Pet. 1:19). God's word doesn't change from age to age. It's not possible to trust God without trusting His word. Friend, are you trusting what God has revealed in the Holy Bible? Point #3: God was the Source of his salvation. Paul stood firm on what God had told him; that is, that their lives would be spared (v.22). There is no salvation in any other name under heaven given among men, whereby we must be saved except by the name of Jesus Christ (Acts 4:10-12). Paul stood on God's promises even when the howling storms of doubt and fear assailed because he most certainly knew that by the living Word of God he would prevail. I Peter 1:25 states, "But the word of the Lord endureth for ever. And this is the word which by the gospel is preached unto you." And, Luke 21:33 promises. "Heaven and earth shall pass away: but my words shall not pass away." Reader, you are standing on sinking sand if you're not standing on God's Word. If you're putting your trust in anything or anyone else but Jesus Christ, you are like that foolish man who built his house on sand (Matt. 7:26-27). He would watch every day for some sign of a ship or airplane passing by. He prayed to God for help. Some days he would get discouraged and wonder if he would ever get off that island, but still he prayed. He asked God why did this have to happen. He did not understand. Later that day a ship appeared on the horizon and soon landed on the island and rescued him. They told him that they were plotting a distinct course and noticed smoke off in the distance and thought the smoke was a signal for help. Let's look at how Paul's ill-fated sea voyage turned out. 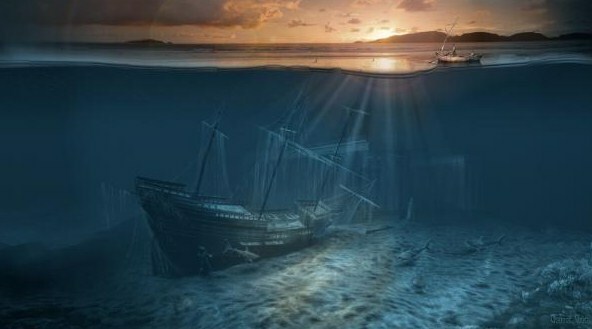 The ship ran aground and was broken in half with the violence of the waves. They jumped out and swam out into the sea to get to land. Some reached the shore on boards, and some on broken pieces of the ship. And so it came to pass, that they escaped all safe to land. Out of the storms and travails of this life we can build a stronger faith and hope on the One who shed His blood for us on Calvary. Through the greatest storm in Christ's life, He conquered death. We, too, can have victory, and beauty for ashes. God will work out all things for your good if you love Him (Rom. 8:28).